The end of the story is that we did it. The kids and I fed and separated the animals all by ourselves. But as usual, stories involving me and the goings on at the farm are never boring. Oh, no…they are full of…we’ll call it excitement. I am almost always up for trying new things. Since meeting the farmer 13 years ago, I have learned that the most fulfilling way to live is to simply try something once. It is amazing how much you can learn about yourself and the world around you by giving something new a chance. As I wrote about in my last article, if there is a task that I can do that will help the farmer or save him time, I earnestly try to do it. After all, he has made a lot of my crazy ideas happen! My ratio of tasks attempted to tasks successfully completed is not that great. Task: kill snake…check. Task: milk cow…check. 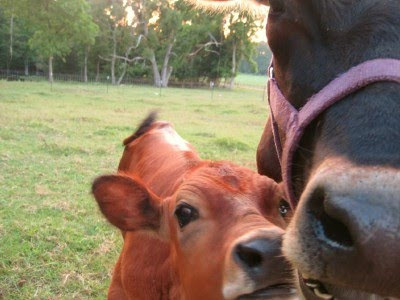 Task: feed and separate animals…no check. 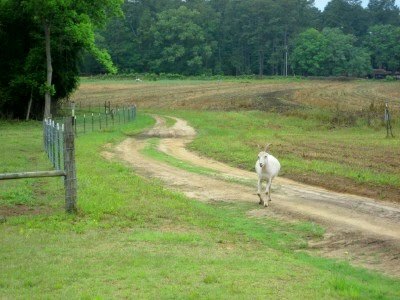 Task: put goats back in pen…no check. Task: fix the water situation in chicken coup…no check. Well, 2 out of 5 ain’t bad. I may not be especially wise to all the inner workings of farm life, but I am definitely not dumb…I realized I had a secret weapon right under my nose and I have officially unleashed its power. The youngens! That’s right, the littles can’t live here for free so the deal we’ve worked out with them is that they exchange farm hand type work for room and board. It has proved to be most valuable around here. My track record is suddenly 5 for 5 with their assistance! The first time I failed with the animals I knew immediately where I had gone wrong. I knew that had my daughter been around, we would have succeeded. So last night when I knew the farmer would be in late and I could help by taking care of this seemingly easy task (and I also needed a good story for my article) I told my 7 year old and my 4 year old what we needed to do. There was also a promise of sour gummie worms for a job well done. We marched outside. We poured food. The kids jumped the fence with another bucket of food. 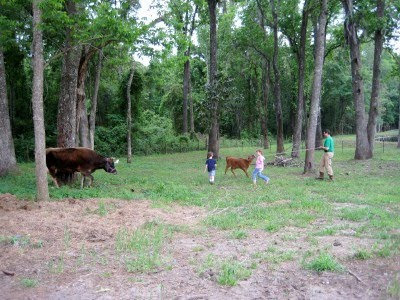 They ran around herding 3 goats and a bull calf. I shouted orders. They kept running around in circles. I shouted more orders-run toward the gate not toward the corner! The goats knocked the bucket down. I shouted more orders to pick it up and run. They ran. Bull calf not cooperating (big surprise there). Goats not letting bull calf eat out of the bucket (another big surprise). Kids running. 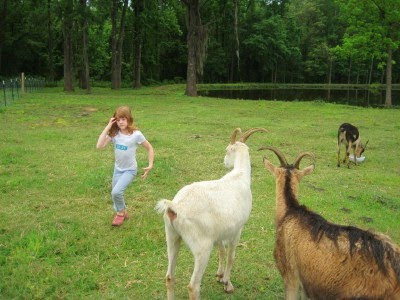 Son screaming “Ninja goat fight!” Daughter getting frustrated. I am pointing and shouting again. Gate is closing. 3 goats and the calf are successfully separated. Whew! The only part I left out is that this process took at least 20 minutes. Ok, maybe it was 30. This is quite shameful considering it takes the farmer approximately 3 minutes to complete this task and there is no shouting, pointing, frustration, or ninja goat fighting needed. I told the farmer that the task was completed. He was quite pleased. I had to admit to him that I wasn’t sure that the 30 minutes and all the “excitement” it took us to do it was really worth the 3 minutes we saved him. But we tried something new. We learned about ourselves. We learned about the world around us. Our lives were full of fulfillment, right kids? Yes Mama…now can we have our gummie worms?! 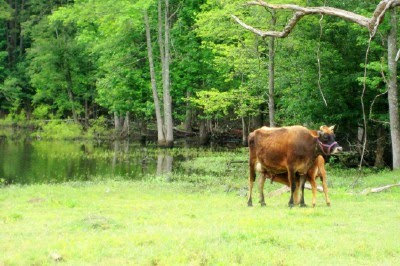 If you’ve been reading my column for awhile you know that although I have 11 animals and 2 fish in my jurisdiction, I still don’t consider myself to be an animal person. The older I get, the more I realize that there are things in life that if one is not exposed to them as a child, it is quite difficult to get accustomed to them as an adult. I wasn’t very adventurous as a child. I’ve never been a risk taker. I was afraid of dogs until I got one when I was 22. I admit it, I was a pretty sheltered young lady. But thanks to the farmer-hubby, I’ve backpacked to 13,000 feet in Wyoming, killed snakes, raised a calf from a bottle and eventually milked her, and learned that most noises in the night are just that-noises. I’ve come a long way, baby. I still have a few things on my list of what I’d like to be able to do independently. Not for my own glory, but to help out the farmer. I’m usually content to stay inside and tend to the youngens. But I’ve learned that helping out with the little things can save him a lot of time and free him up to do other more important and difficult things that I have absolutely no business learning how to do. These are the days of planting on the farm. These are long days for the farmers. In order for us to have milk in the morning, Bittersweet cannot spend the night with his Mama. I know the last thing farmer-hubby wants to do when he gets home is feed and wrangle the animals into their respected pens for the night. But he’s the one who has to do it because it involves trickery and deceit and you have to be inside the pen with all the livestock in order to accomplish the task. You can probably imagine how I feel about all that. Last night was going to be an especially late night for the farmer, so I said to myself, “Self? What’s a good lookin’ person like yourself doin’ in a place like this?” Ok, that isn’t what I really said, but my Grandfather used to say that all the time and everyone thought it was funny. What I really said to myself was, “Self? Why can’t you try to separate the animals tonight? All it involves is food and a little luck. You’ve watched the farmer do it for 3 months. Now go out there and just do it.” Well I went out there alright. And lady luck was not on my side. That rascal of a calf wouldn’t leave his Mamma’s side, the goats tried to steal the food from me before I could get it to their bowl, and the Mama cow ate her ration before I even began to separate anyone. The farmer makes it look so easy. I made it look so hard. If my 7 year old daughter had still been awake, I would have been able to do it. Well, she would have been able to do it. I would have simply supervised and slammed the gate when she said so. But alas, I had to send the text to the farmer that said, “I tried to separate the animals. Failed. Sorry.” And his reply, “Thanks for trying.” He was probably chuckling to himself envisioning me out there. I am not quick, I am not wise to the ways of working animals. I don’t know that I ever will be, either. I am awkward and fearful and overall out of place in that pen. But I try! I try to overcome the awkwardness. I haven’t given up…tonight is yet another opportunity to add a new trick to my bag. That's a good girl Heidi. That's a good boy Scrappy. Lock the gate up tight, Heidi. 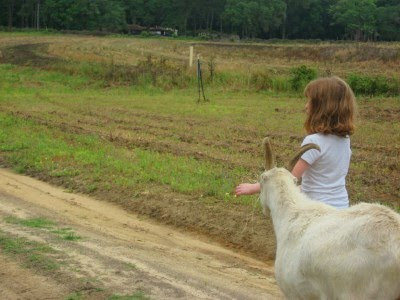 I know, your little assistant goat herder behind you didn't help you one bit. And no, you are never leaving for college. Can't you see I need you here? I remember Saturday mornings in the city. We would leisurely arise, eat breakfast, slowly sip coffee, browse through the paper, and then decide what we may like to do that day. Ah, the city life. Saturday mornings in the country are way more exciting than city Saturday’s! Oh yes folks, that’s the day when I chase foxes from my back door and dehorn and halter train calves. No rest for the weary around here! 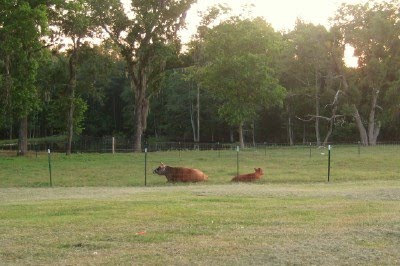 Farmer-husband had decided that we would keep our bull calf “intact” and use him for future breeding. Because of the rumor that Jersey bulls are the meanest bulls on earth, the farmer said Bittersweet couldn’t live here and keep his horns, so the deed had to be done. And bright and early one Saturday morning was the day. A cauterizing tool was involved. A lasso was involved. A lot of wincing and looking away was involved (on my part). My sister from Miami wanted to know if we were going to give the calf any anesthesia. I wanted to know if she was kidding. She wasn’t. Bittersweet sticks close to his Mama, which is a precious thing considering their history, but it makes it very difficult for us to catch him. Farmer-hubby has gotten quite good at his roping skills! It’s like our own personal rodeo right in our front yard. Again, can you get free entertainment like this in the city? I don’t think so. 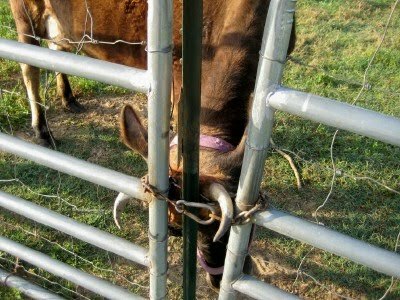 Once he was caught, and the dehorning in process, I decided that I better offer my services. Not that I have many services to offer in this type of a situation, but still, I felt I need to at least ask hubby. “Do you need anything?” I quietly offered from around the corner. Silence. Hmmm, maybe I shouldn’t have said anything. I hear rustling and grunting. He then mutters, “Somebody stronger.” I almost said, “You mean someone stronger than me? Or someone stronger than you?” But I held my tongue. I figured I’d better wait on those questions. Hubby didn’t seem like he was in the mood to chit chat. So I waited, tried to peer around and see what I could see-nothing. But I could smell burning alright. I would later learn that hubby had burned his own hand pretty bad during the process as well. Ouch! Bittersweet didn’t enjoy human contact much before this event and I can tell you he surely doesn’t trust us any more now, after the fact! For first time dehorners like ourselves, it was a difficult to know if we had done this procedure correctly and thoroughly. We're row croppers for pete sakes! It looked pretty good to us, but what do we know? Correction, what do I know? Unfortunately, when time tells if we have or not, it will be too late to do anything about it. Poor Bittersweet may just have to live his life with one or two peculiar shaped horns. I’ll try to never put him in front of a mirror. 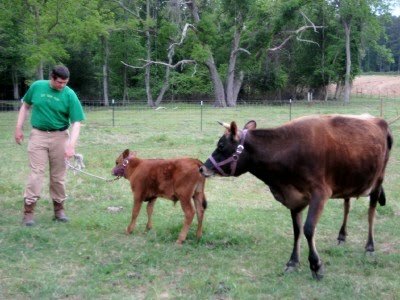 The next Saturday was time for halter training. Once again, we had a rodeo in the front yard to get the lead clipped on to the halter. If you’ve ever put a leash on a puppy for the first time, you are familiar with what we were about to deal with. Bittersweet had not a clue that we simply wanted him to walk. He dug in his heels, pulled back his neck as far as he could, and put every ounce of his weight in his rear end. This went on for awhile, until his Mama came over to see what was going on, and she was able to get him moving forward for us. The scene in the pasture was this: Farmer hubby with a lead pulled taught on a calf that won’t budge, an 800-lb Mama cow (with horns) putting her 2 cents in on the matter, 2 youngens roaming about trying to herd the goats, 2 cats roaming about trying to herd the kids, 1 farm dog sleeping in the grass (she’s the only one with the right idea!) and me-taking photos and shouting ideas from the sidelines. 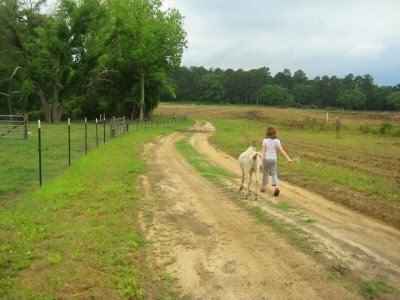 I’m telling you what- my Saturday’s have never been the same since I moved to the country and I can’t complain one bit! Reading her mind...Can I ever get a little me time?